This probably has something to do with the problems at Chicago. Niantic announced that it will be postponing several upcoming European events for "later in the fall." Presumably as a result of the backlash to the Chicago Pokemon Go Fest event. 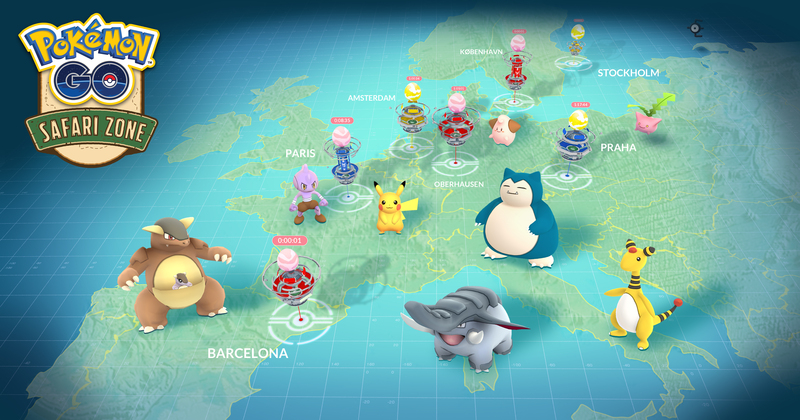 Originally, Niantic planned several Safari Zone events in European cities like Copenhagen, Prague, Stockholm, and Amsterdam. The events were scheduled for dates in early to mid August at participating locations. However, those dates have been pushed back to a later date which Niantic hasn't disclosed yet. Niantic revealed that no other events have been postponed, including the August 14 celebration in Yokohama, Japan, or the September 16 events in France, Spain, and Germany. Planned Pokemon Safari Zone locations. "We apologize for any inconvenience and hope you understand that our priority is to ensure a great experience for Pokemon GO trainers in Europe and around the world," wrote Niantic in a blog update. Niantic also announced that as an apology for the European event delays, Pokemon that are rare in Europe will begin appearing in certain European cities for a limited time. Niantic held the first live-event for Pokemon Go in Chicago last earlier this month, but technical issues related to server crashes, and long lines caused major problems for players who traveled to Chicago to attend. The resulting chaos forced Niantic to issue a full refund for ticket buyers, as well as offer in-game rewards like $100 of Pokemon coins and a legendary Pokemon. However, some players have filed a class lawsuit against Niantic, demanding compensation for their travel costs, which were higher for attendees who traveled cross-country, or from abroad, to attend the event in Chicago. Hopefully Niantic will be better prepared for technical and onsite management problems this time around so as to avoid a similar outcome in Chicago. Tagged with News,	Niantic,	Pokemon.